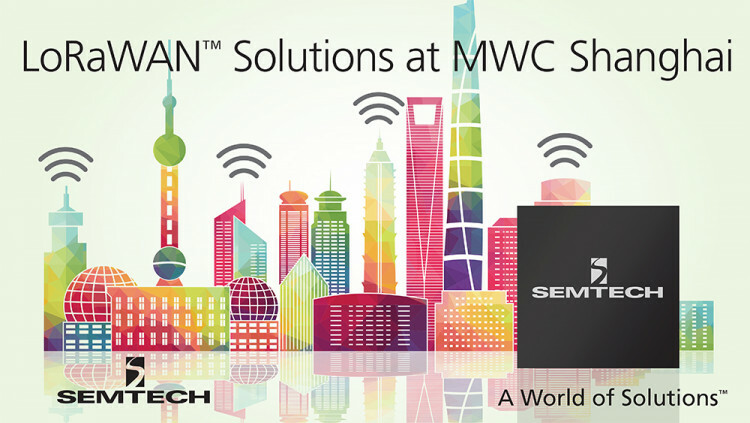 Semtech Corporation(Nasdaq: SMTC), a leading supplier of analog and mixed-signal semiconductors, will exhibit its LoRa® wireless RF solution for Internet of Things (IoT) networks and applications at Mobile World Congress Shanghai on June 29-July 1. Semtech representatives and LoRa Alliance partners will showcase LoRaWAN solutions for smart city, home and building automation, agriculture and other IoT applications in hall N2, booth #E86. Semtech, Gemtek, Actility, STMicroelectronics, MultiTech and Augtek, among others, will display a wide range of LoRaWAN solutions and products designed for the Asian market in the booth, as well as host an information session and reception on the evening of June 30. The event is closed to the public, but interested parties can request an invitation on the LoRa Alliance website. In addition, Jaap Groot, the Vice President of Systems Business Development for Semtech’s Wireless and Sensing Product Group, will make an exciting announcement and presentation regarding the LoRa technology on June 30 at 3:00 p.m. in the Pudong Room of the Crowne Plaza Century Park Shanghai. Email aadelman@semtech.com to RSVP. The LoRa Alliance, which was launched in March 2015, is a group of over 300 companies committed to drive and enhance the LoRaWAN standard to ensure interoperability and scalability of LPWANs and IoT applications. LoRaWAN is based on LoRa, which is a widely adopted two-way wireless solution for low power, wide area networks that can support millions of nodes while operating on low power. All statements contained herein that are not statements of historical fact, including statements that use the words “will,” “committed to,” or other similar words or expressions, that describe Semtech Corporation’s or its management’s future plans, objectives or goals are “forward-looking statements” and are made pursuant to the Safe-Harbor provisions of the Private Securities Litigation Reform Act of 1995, as amended. Such forward-looking statements involve known and unknown risks, uncertainties and other factors that could cause the actual results of Semtech Corporation to be materially different from the historical results and/or from any future results or outcomes expressed or implied by such forward-looking statements. Such factors are further addressed in Semtech Corporation’s annual and quarterly reports, and in other documents or reports, filed with the Securities and Exchange Commission (http://www.sec.gov) including, without limitation, information under the captions “Management's Discussion and Analysis of Financial Condition and Results of Operations” and “Risk Factors”. Semtech Corporation assumes no obligation to update any forward-looking statements in order to reflect events or circumstances that may arise after the date of this release, except as required by law.